This is a recipe I got from my lovely cousin. She makes these for family get togethers, and they are little bites of crumbly goodness. 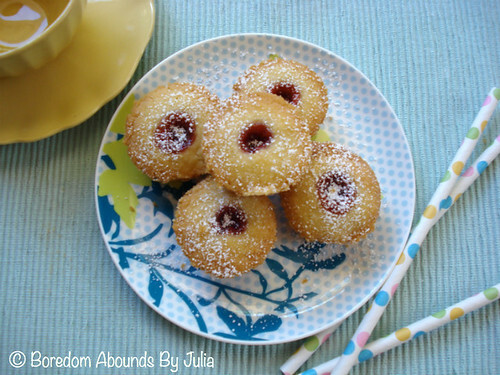 I love a dessert that is small and easy to eat, but completely delicious and full of flavour, and these mini jam tarts tick all those boxes. Something else that's great for us is that they are egg free. We recently found out our (almost ONE YEAR OLD WHAT) daughter is allergic to eggs, so I am now always on the hunt for delicious recipes that are egg free to make for her once she can eat things other than mush. Preparation and cooking time: about 30 minutes. - Chuck the butter, vanilla, icing sugar, and flour into a mixer. Beat until it's combined, and starts to resemble a semi-crumbly, dough like consistency. You may need to add the teaspoons of cold water now if the dough isn't sticking together. - Roll teaspoons of mixture into balls and place into the muffin pan. I made mine about the size of a golf ball. - Make a hole indent into the centre of each ball with your finger. You can make the hole as big or small as you like. I personally like to make it a bit larger, because then you can fit more jam in, which mixes well with the shortbread-like taste. But make sure you don't pierce through the bottom, otherwise the jam will fall out, and we really can't have that. - Spoon jam into each hole, making sure it's level with the top of the ball. - Bake for about 15 minutes, or until golden. - Cool tarts in the pans. - Dust with icing sugar before serving. Aw so cute! Little muffin cookie shortbread tartythings! Hannah, they are soooo yummy!